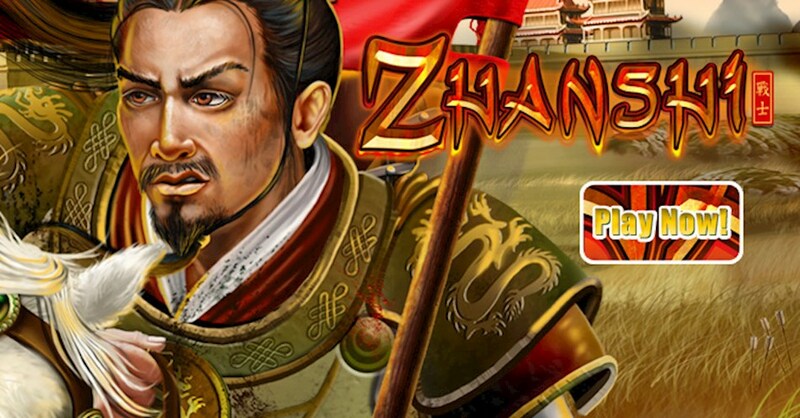 Experience the Orient and fight for glory & honor in Zhanshi the latest slot from Real Time Gaming, with pristine graphics & fantastic prizes this game offers great bonus features & generous wins for those willing to show there warrior spirit. The graphics are awash with Eastern influences from traditional houses to landscapes and banners that enhance the cultural feel of the game, the 3D artwork presents a real leap in the visual effects department something Real Time Gaming are improving on with each new release. The name Zhanshi has many meanings in Chinese, most commonly around symbolism to do with warriors, it's a well thought out name in a market which is saturated by Asian themed titles. The first feature begins when one or more of the wild warriors appearing on-screen during a normal game, up to a huge 25 free games can be awarded, with each having all prizes tripled. The second feature awards 10 free games with 3 or more scatter scattered temples, giving players plenty of time to master the art of Zhanshi. At this stage all prizes are doubled with the feature re-triggering with any or more mixed scattered warrior and/or temples. The wild symbol is the warrior and it appears anywhere on the reel to replace any symbol in a winning combination (except for the Scatter) The scatter symbol is the temple and when 3 or more temples appear on the reel 10 free spins are awarded, the wins are doubled and this feature can be retriggered when 3 or more Warriors or Temples appear. One of the main selling points of this release is the offering of not only a progressive Jackpot but also a completely random one, which can be awarded at the end of any spin, increasing the fun and excitement factors that all slot lovers enjoy. Real Time Gaming have made great strides with their latest release, with its multiple jackpot chances and fantastic 3D graphics it’ll be a great addition to our games list!